December 1, 2014 -- Nearly 250 runners of all ages competed in this year's North Shore Boys and Girls Club Turkey Trot and Fun Run on Thanksgiving Day morning. The five kilometer race began on Glen Head Road in front of Waldbaum's and took trotters through the streets of the hamlet past the elementary school and then northward into the hilly Promenade neighborhood, and eventually back to the Community Center where they were greeted by cheering family and friends at the finish line. It was the second year in a row that the race followed this route, after having taken place at the High School in previous years. The top runner with a winning time of 14.56 was Ben Kapuscinski, a 2013 graduate of North Shore High School and currently a sophomore at the College of St. Rose. 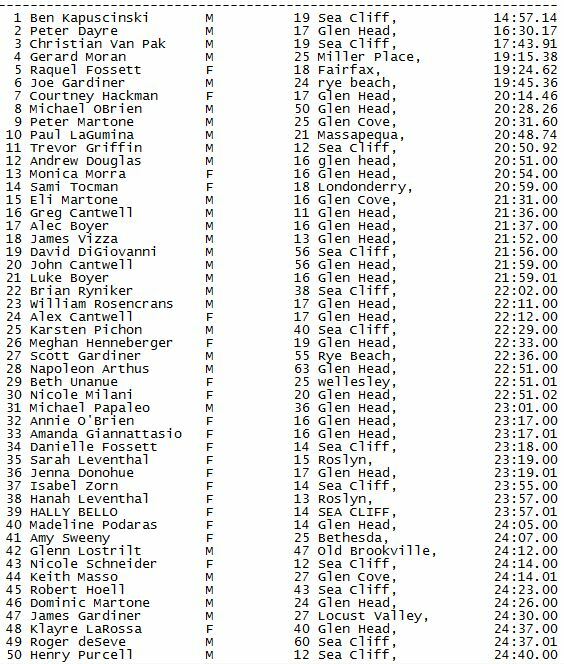 Raquel Fosset, another North Shore Alum (2014) and track stand-out, who now attends George Mason University, crossed the finish line two and half minutes later at 19:24:62 to lead the women's division. North Shore Boys and Girls Club President, Michael Capobianco along with North Shore High School Track and Field coaches Neil Levy and Ed Corona were the principal organizers of the event. "The North Shore Boys and Girls Club Turkey Trot and Kids Fun Run was a great success," said Coach Levy. "The North Shore High School track teams and alumni did a tremendous job in helping in organizing this year's run. On behalf of Mike Capobianco and Ed Corona we look forward to next years event. See you Thanksgiving morning in 2015."